Hillsborough County voters should know what they’re voting on before they vote. So, what about the massive transit tax hike charter amendment on the November ballot? 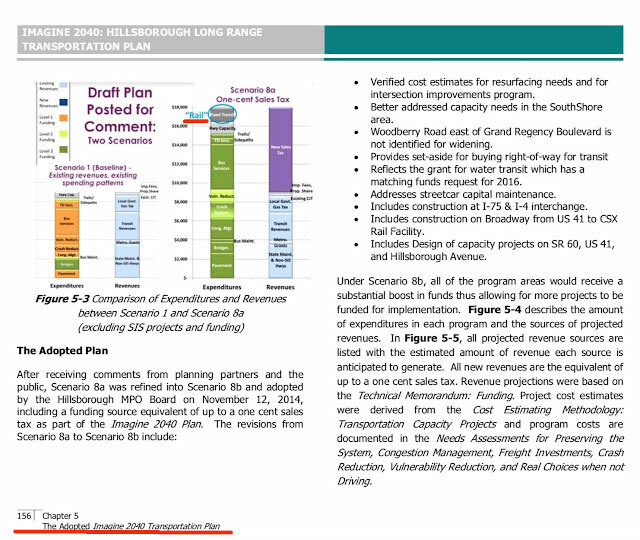 There is no transportation plan and not one project referenced in the ballot summary language or in the five pages of the All for Transportation (AFT) tax hike charter amendment. AFT did not provide the voting public any specific projects that the 30-year, massive 14 percent transit-tax hike actually funds. Yet, it has been reported in local media that it is funding the Metropolitan Planning Organization’s 2040 Long Range Transportation Plan (LRTP). When the petition drive began in June, the Times published an article titled, "Petition language reveals details of Hillsborough sales tax transportation initiative:"
The Hillsborough MPO admits in its 2040 long-range transportation plan (LRTP) that the majority of respondents to its public outreach resided in the city of Tampa. Tampa has less than one-third of the population of Hillsborough County; 6,000 respondents is less than 1/2 percent of the population of Hillsborough County. Is spending additional transportation funds (e.g. tax hikes) in the City of Tampa the best way to improve transportation in Hillsborough County? What about unincorporated Hillsborough, traffic-congested Brandon and rapidly growing South County? While the 2040 plan is still in place, it is now quite outdated. Since it was formulated, the county commissioners created a 10-year transportation funding plan. "The word 'charter' did not appear in the amendment text, title or summary." Neither does the word "rail" appear anywhere in AFT’s charter amendment. It is not in the text, title or summary of the transit-tax-hike ballot language. It is nowhere to be found. But ... costly rail is all through the MPO’s 2040 LRTP. It is included in the MPO’s one-cent funding scenario. Interesting that we find the use of one cent vs. 1 percent to describe a transit tax hike in the MPO documentation and AFT’s ballot language. Is that coincidental? Previous proposed transit-tax-hike ballot language used percent terminology, because that is how the transportation surtax is referred to in state statute. Beth Alden, executive director of the Hillsborough MPO, has told us the MPO will include rail again in its 2045 planning they recently began. The MPO must be counting on AFT’s transit-tax hike passing in November so its 2045 LRTP will match it. As we stated previously, no transportation plan is referenced, and not one project is identified in the AFT tax-hike charter amendment language, ballot title, text or summary language. "Those who so firmly believe in charter schools should be more than happy to let them appear on the ballot by name, not by subterfuge [deceit or deception]. ... Instead, voters were nearly left with no context to suss out the schools that shall not be named until the Florida Supreme Court made the correct decision on behalf of clarity and candor. When contacted, the Times stated reporters were told by someone from both the MPO and AFT, when the petition drive began in June, that AFT’s transit tax hike was funding the 2040 LRTP. When we subsequently asked the Times who at the MPO and AFT told them that, we did not get a response. It is logical to assume it was Beth Alden from the MPO, because she was quoted in the Times' June article. Does the AFT massive tax hike fund the MPO’s 2040 Long Range Transportation Plan or not? If so, why did AFT NOT disclose that anywhere in its ballot title, text or summary language and/or reference it anywhere in the charter amendment? If AFT’s transit-tax hike is not funding the MPO’s 2040 long range transportation plan, then what transportation plan and projects is its 30-year,14 percent transit tax hike funding? The MPO confirmed voters want to know clearly defined projects that any additional funding would be spent on. So, where is the clearly defined list of projects that will be funded by AFT’s 30-year 14 percent transit-tax hike? Voters want to know this information BEFORE the election. This is especially important with this massive tax hike, because the five pages of tax-hike regulations prohibit and greatly restrict changes -- even when there is failure or an economic downturn. Taxpayers are stuck for 30 long years. The Times should hold AFT’s charter amendment to the same level of accountability, clarity and honesty to ensure voters are not subject to any ballot language deceit and deception. Hopefully, there's a BIG voter turnout in Hillsborough and the voters resoundingly VOTE "NO"! Same goes for the Tampa City Council and Hillsborough County Commissioners in responding to MLB's and Sternberg's 'begging'! I would not vote on any addt'l tax. Transit should be funded by the Feds and the State. It is long overdue for Floriduh to do some something about its 3rd world transit system. It is an embarrassment that countries with 5 million people have better transit than this state, supposedly in the top 20 in economies of the world...what a joke.